How Ezcab Panic Button Works? 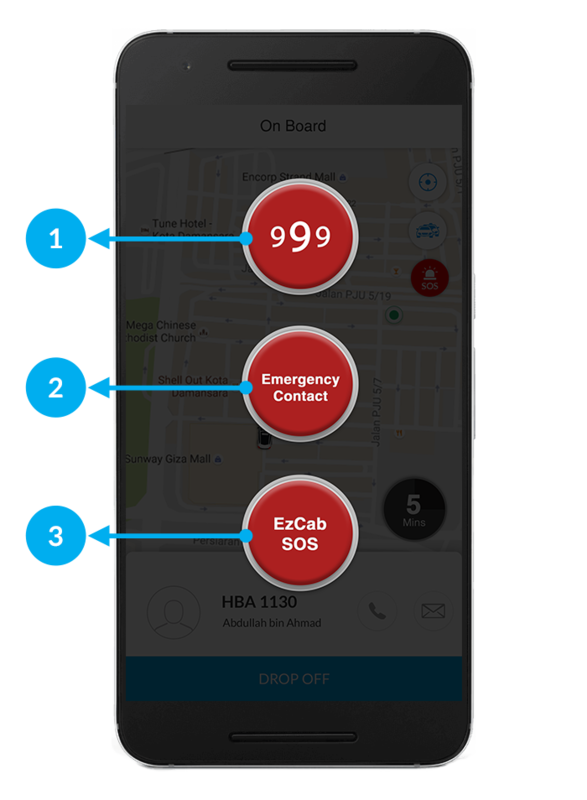 EzCab in-app “Panic Button” allowing you to push a central button for immediate contact with various emergency services to alert relevant parties of an emergency situation. The panic button instantly displays your location to the person, service, or authorities who attend your call to reach out to nearest potential responders. In the event of an emergency or a dangerous situation involving an immediate threat. Which will only be displayed once you’ve inserted your emergency contact number. This button is to notify your contact of an emergency situation in the event you’re unable to communicate with them (i.e. medication allergies, etc.). Trained operator will attend to you with an immediate call and to the driver assigned. If both numbers are beyond reachable, a nearby Taxi will be alerted to drive to the location. What happens if the SOS button is accidentally pressed? The selected emergency service will answer the call. If there is no verbal response from the vehicle's occupants, the operator will dispatch emergency personnel to the vehicle location. In the event the button is accidentally pressed, you can push the button again to cancel or have the operator end the call, and no emergency personnel will be dispatched. When will the SOS icon pop out on screen? SOS icon will only pop out on screen when booking is done after click the ‘picked up’ button. For further enquiries, please email to support@ezcab.com.my or PM us at Facebook.com/ezcabmalaysia. ← Jom Balik Kampung Bersama EzCab!